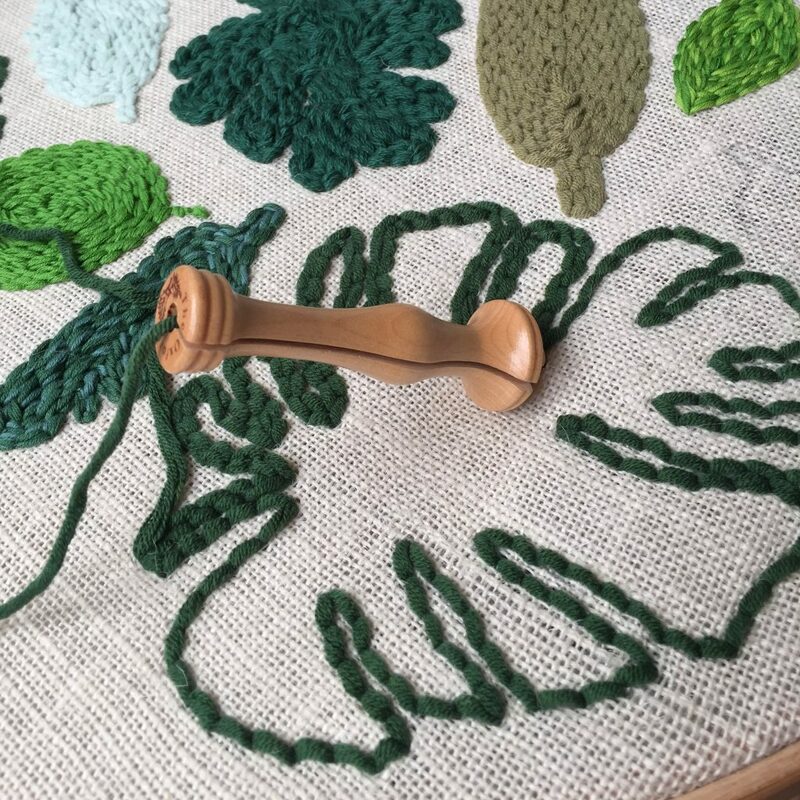 I already told you I’m not a monogamous crafter – there are always at least 5 projects laying around in my studio asking to be finished (‘pretty, pretty please, Marianne … ?’). The main reason for this is ‘the call from the creative brain’ to “just” give this new idea a try. Also, sometimes a project is simply too big to carry around (e.g. 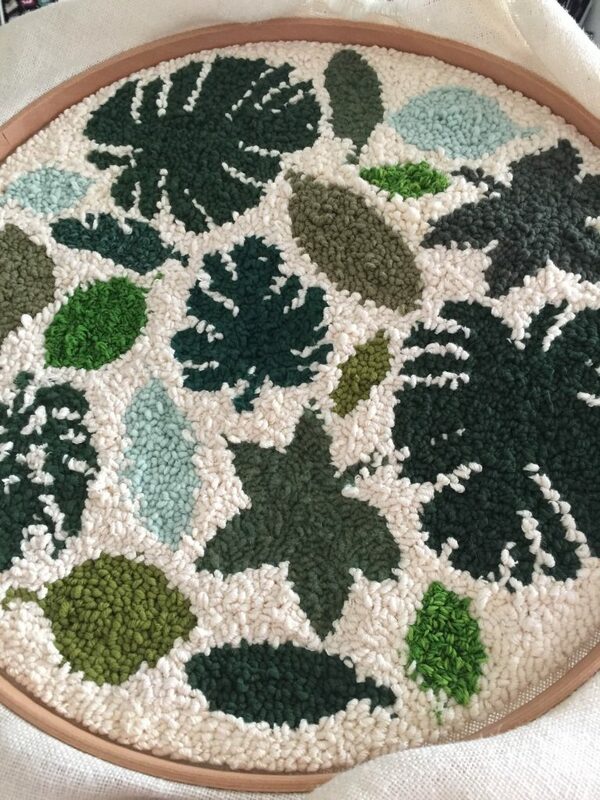 the “Graig&Karl”-blanket), so it has to stay up in the studio and can’t be worked on in the evenings, when I like to spend time with the family downstairs. 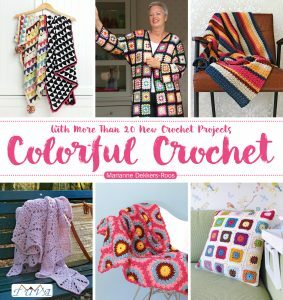 Since I’m never nót crocheting, an easy-to-carry-around project is begun quickly then. 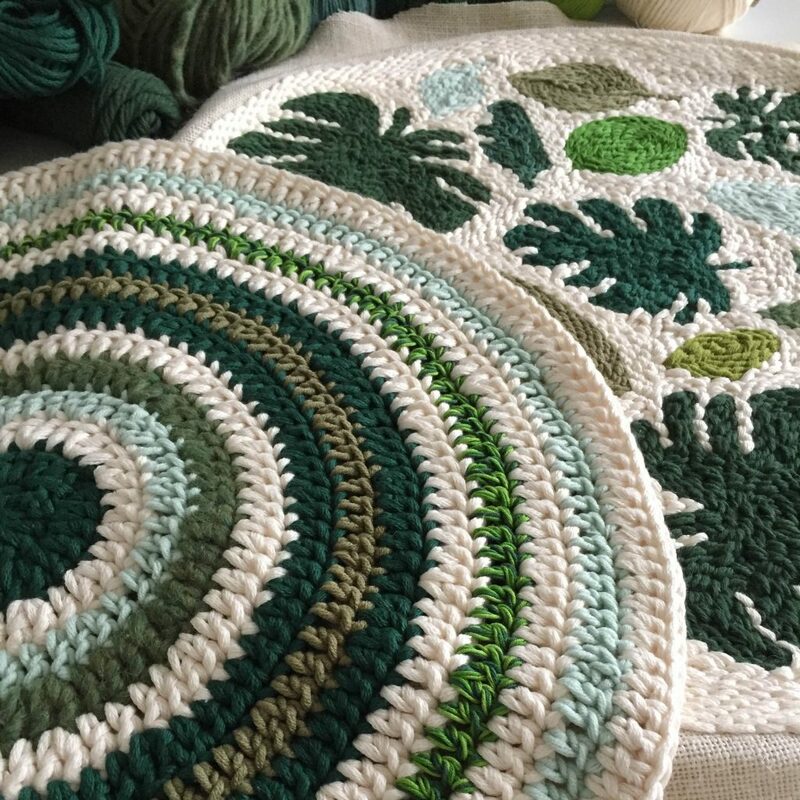 Other times, I finish a project and forget to take pictures, quickly moving on to the next wip, and after that I completely forget to post the fo (‘finished object’). 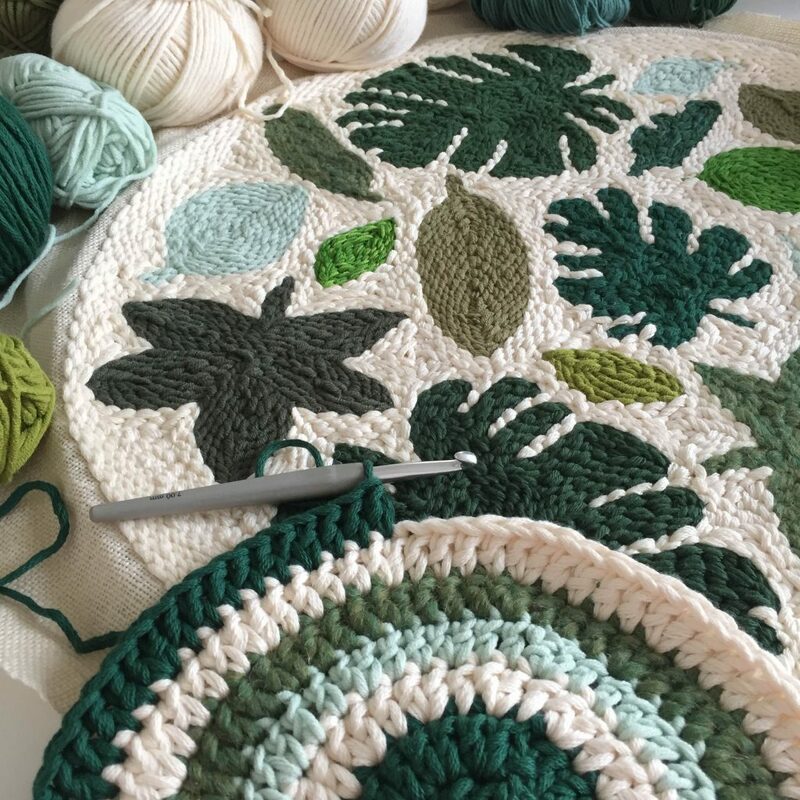 It usually happens when I’m ticking off multiple wips almost at the same time – a sheer coincidence, but it hás happened several times already. 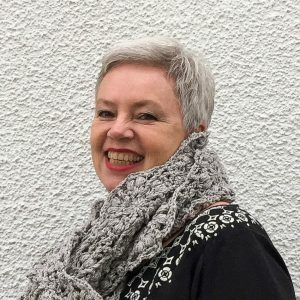 I’ve made a note to post the fbfo’s (‘finished but forgotten objects’) here as well. 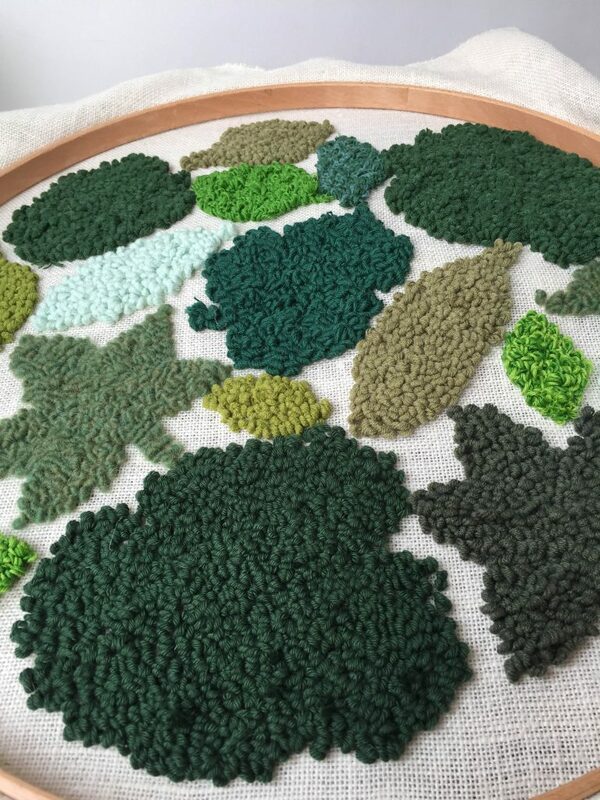 It feels good to report I’ve made good progress on several wips since my last blog post! 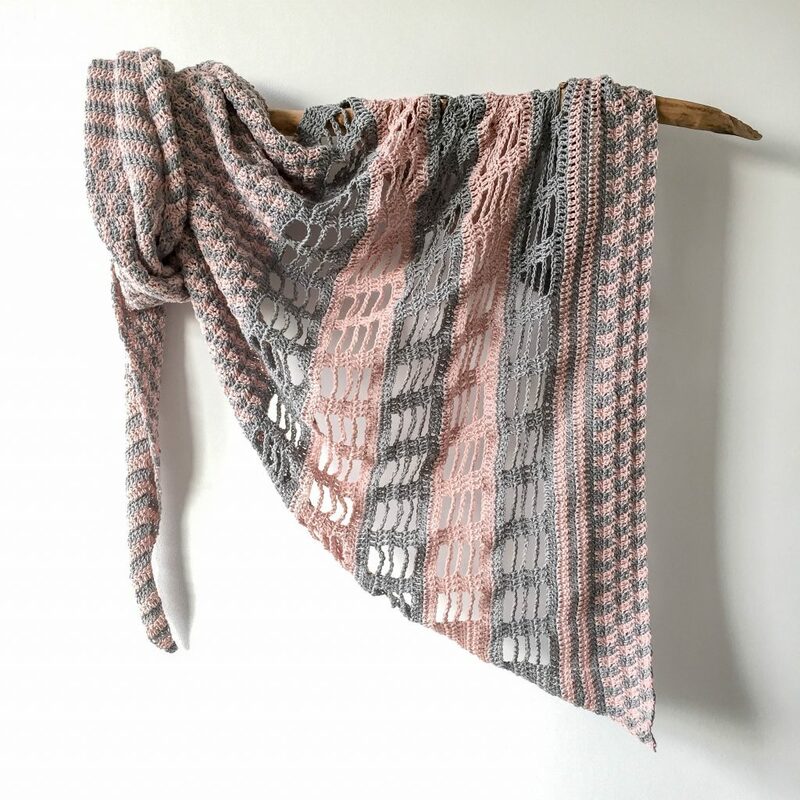 I’m f i n a l l y done with the “Lemvig Shawl”-pattern ↓, and its being tested as we speak! 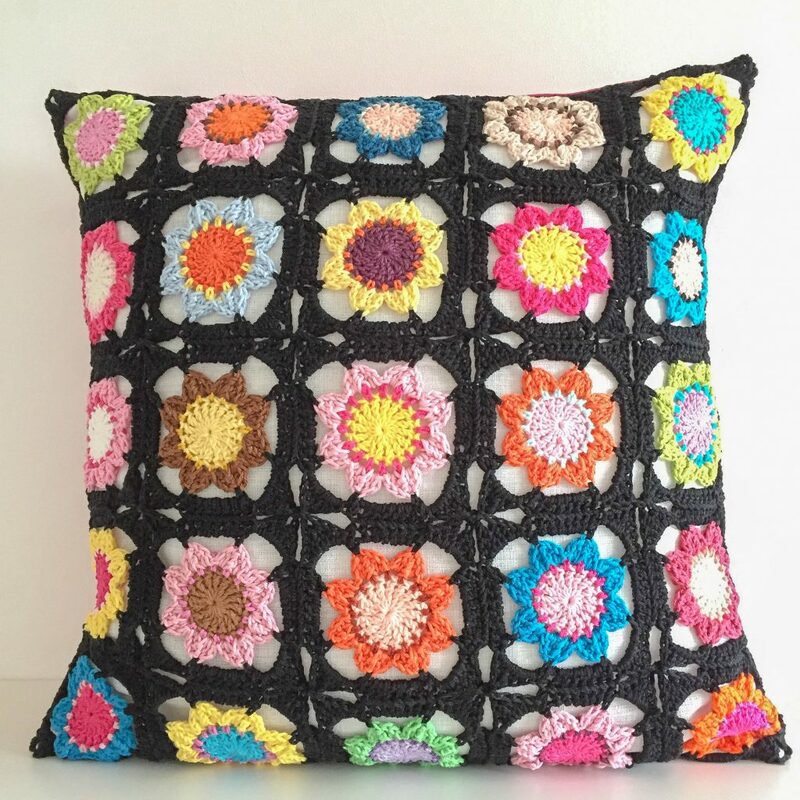 The “Jenny’s Flower Granny Square”-cushion cover with its flowers joined with black is ready as well, and I’m telling you: it’s such a pretty duo with the off-white version. 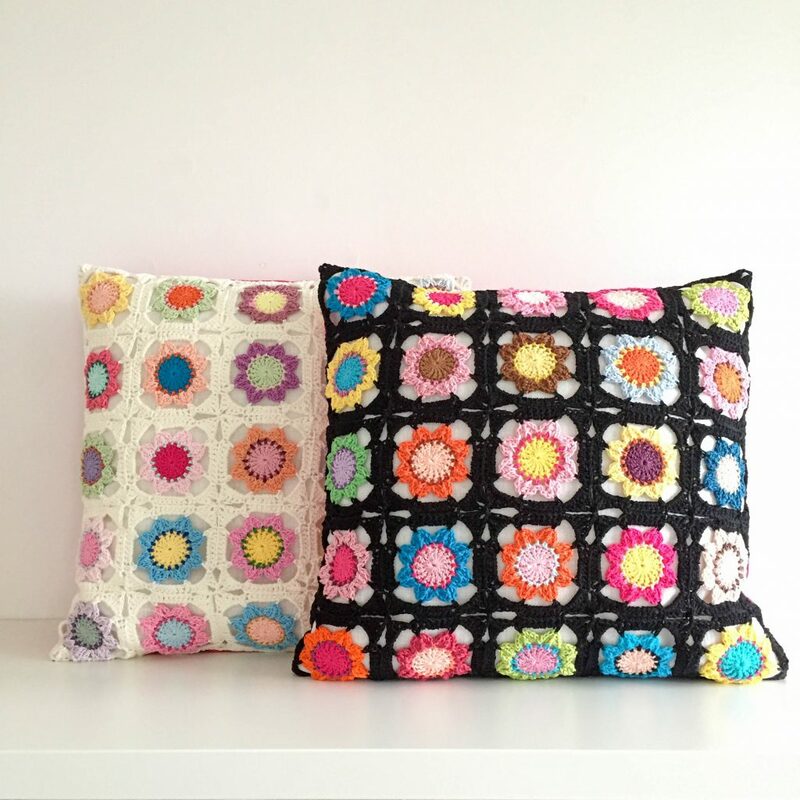 I’ve used the same fabric in the envelope-style cover for both cushions, thus making them a nice set. 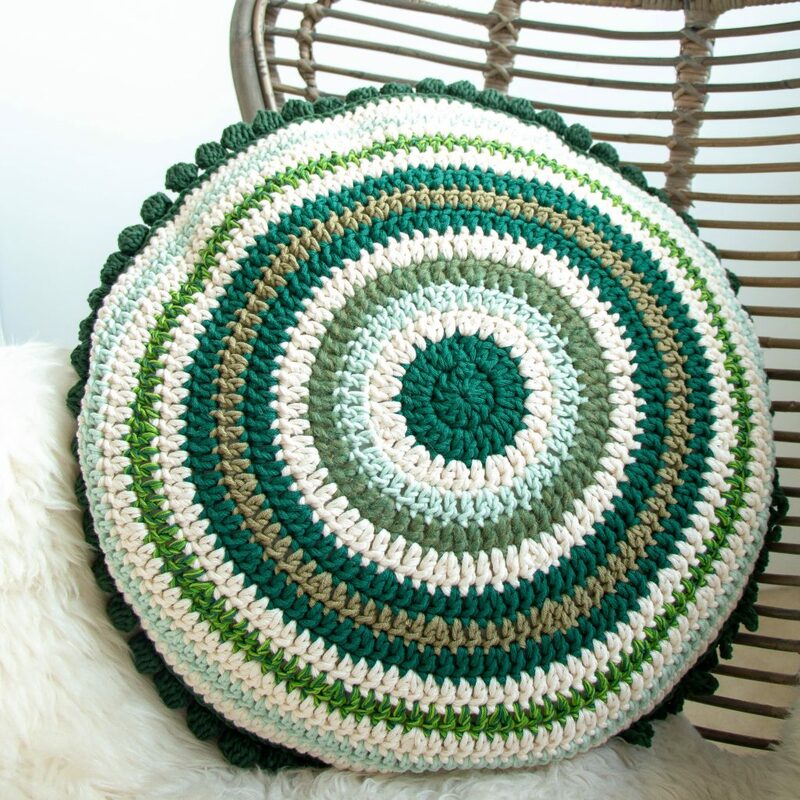 Both have been listed – seperately – in the shop, so if you don’t want to crochet one yourself (pattern here), there are now two ready-to-go versions for sale as well. 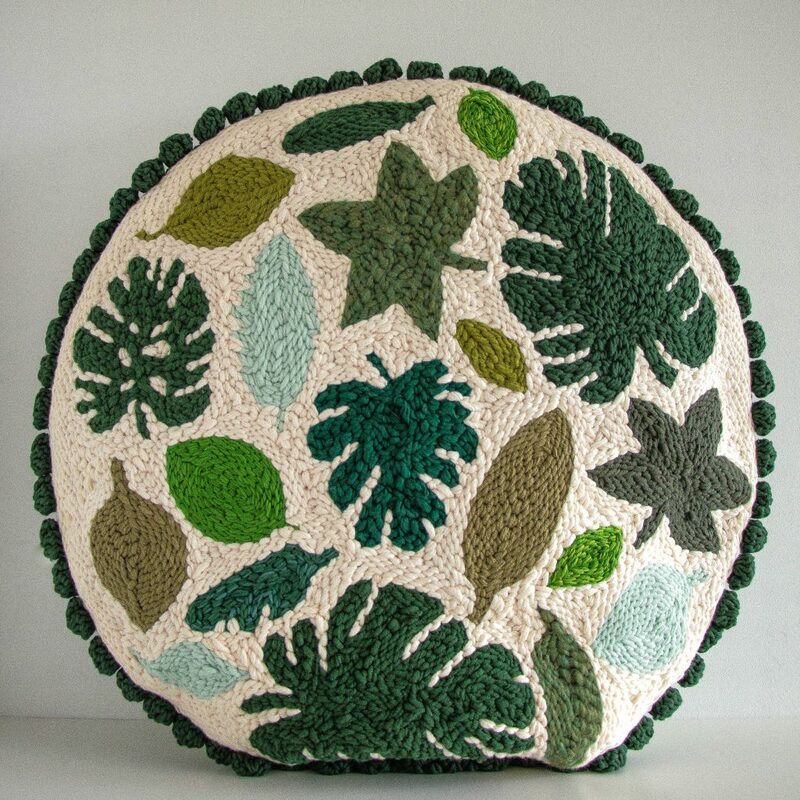 However: right now the main ‘ta-dah’ goes to the “Leaves Punch Needle Cushion” that is finished, and I can’t help myself: I soooo love how it turned out! 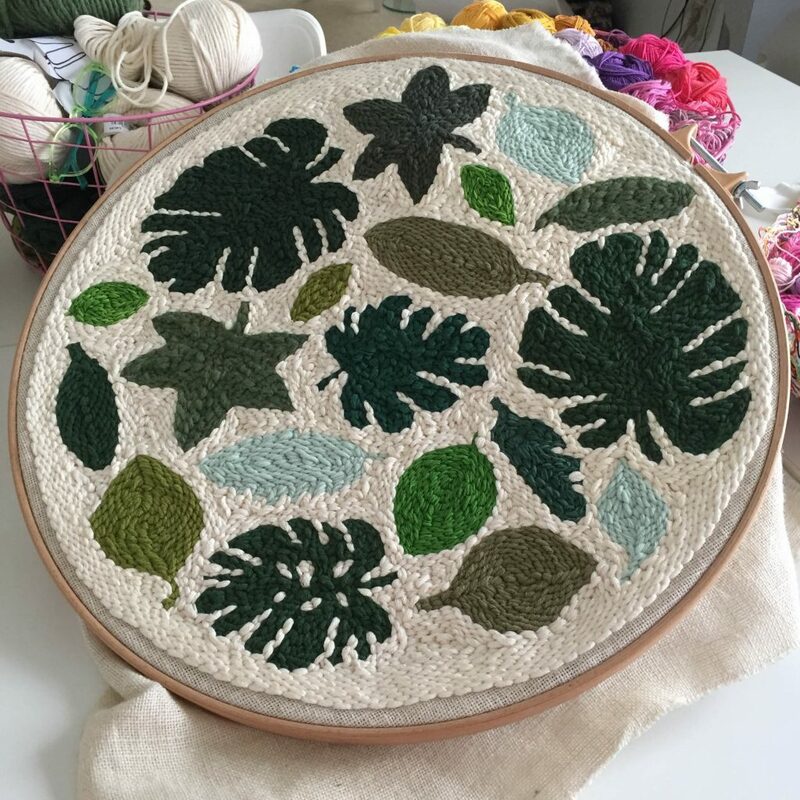 It all started with the huge 50 cm embroidery hoop I got during one of my visits to the G. Brouwer&Zn-warehouse, the arrival of my Amy Oxford punch needle, the perfect fabric (a jute/linen, found here), and the monstera leaf pattern I made for one of my “Punch like a Pro”-workshops. 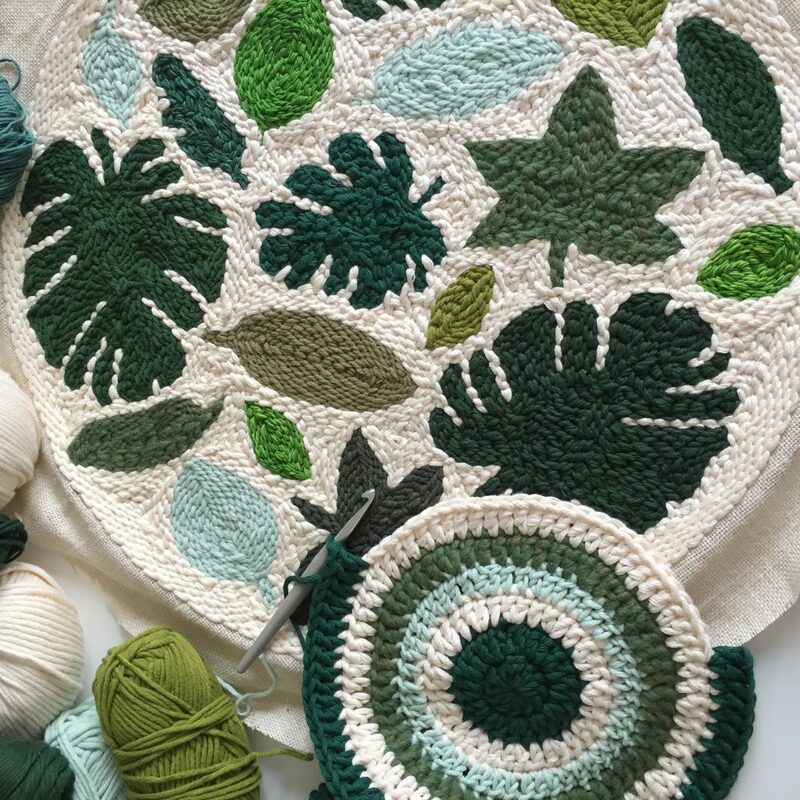 I made smaller and bigger versions of the monstera leaf, added different leaves, gathered all the green yarn I had in my stash, and … began punching. 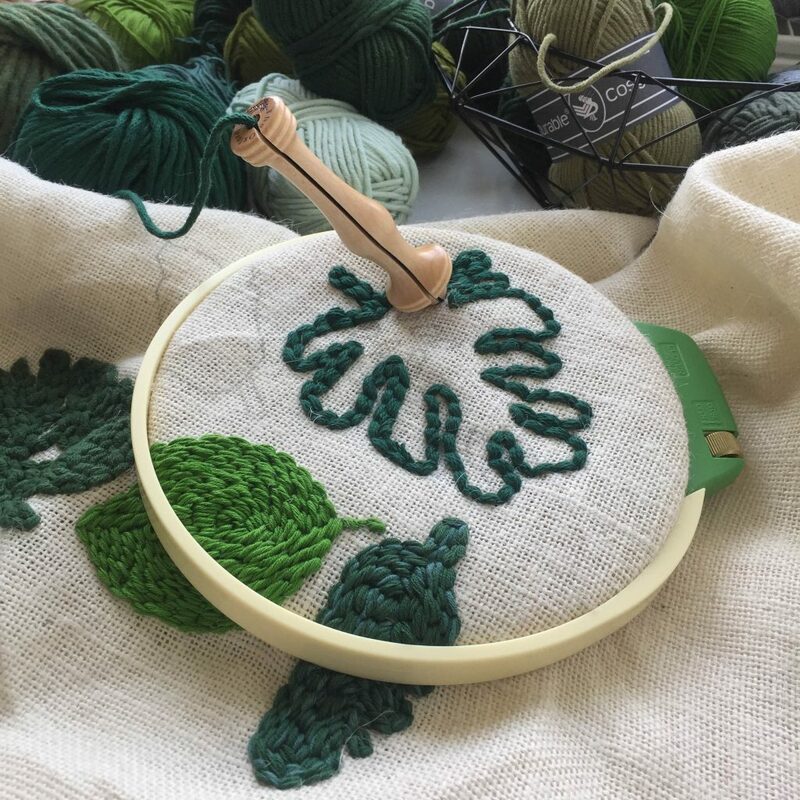 Thís definitely was an ‘in-between’-project – I always brought it with me to my workshops, to show people the ultra-cool things you can do with a punch needle, some fabric and yarn once you’ve mastered the craft. 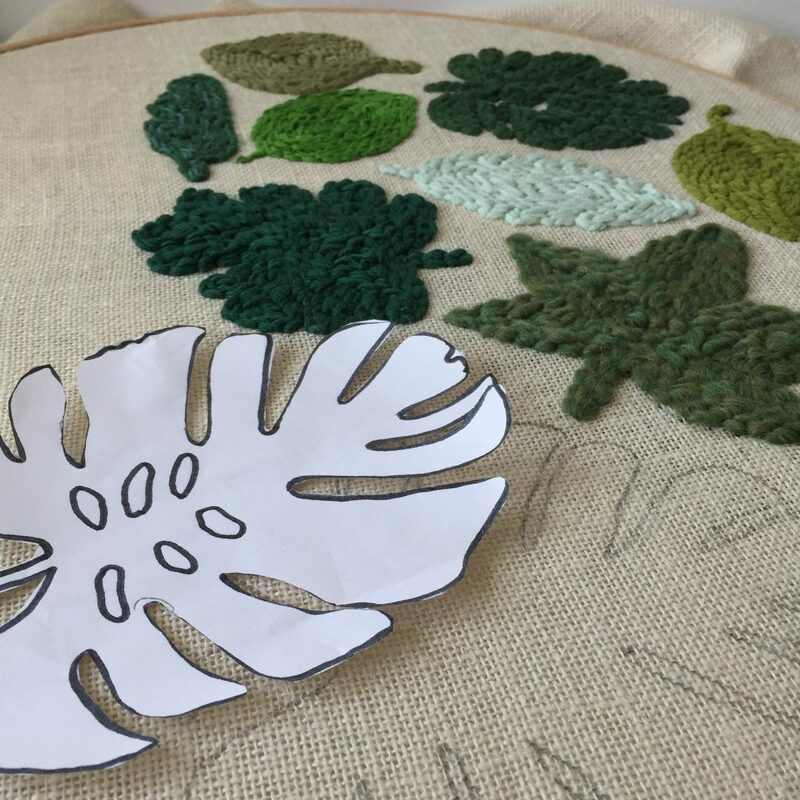 I think it was the workshoppers’ enthusiastic response to the leaves-project that made me want to finish it. And now it IS, and I could not be happier with it! 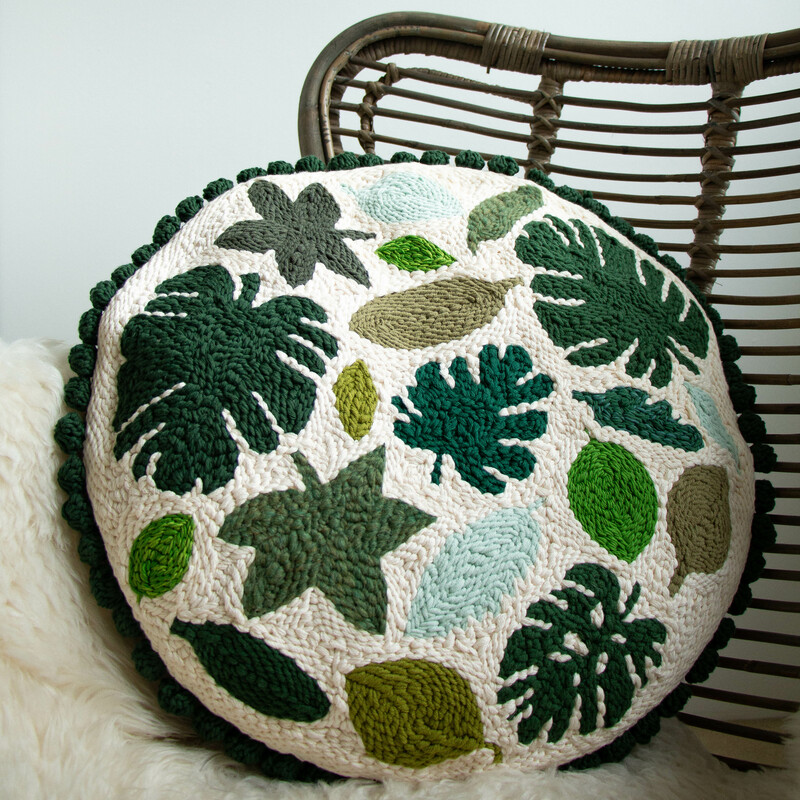 Maybe I’m so pleased with it too because it brings together my two real crafty loves: crochet & punch needle – you see, I crocheted the back of the cushion, and added an also crocheted pom-pom border to sort of frame the cushion. 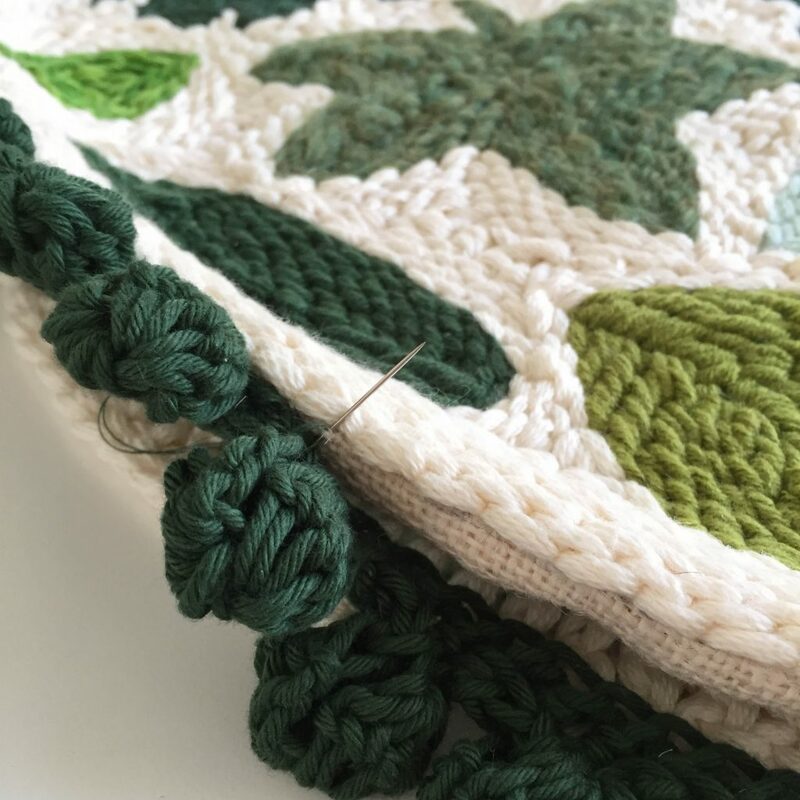 After I finished the punch needle front, I hand stitched a seam all around it. 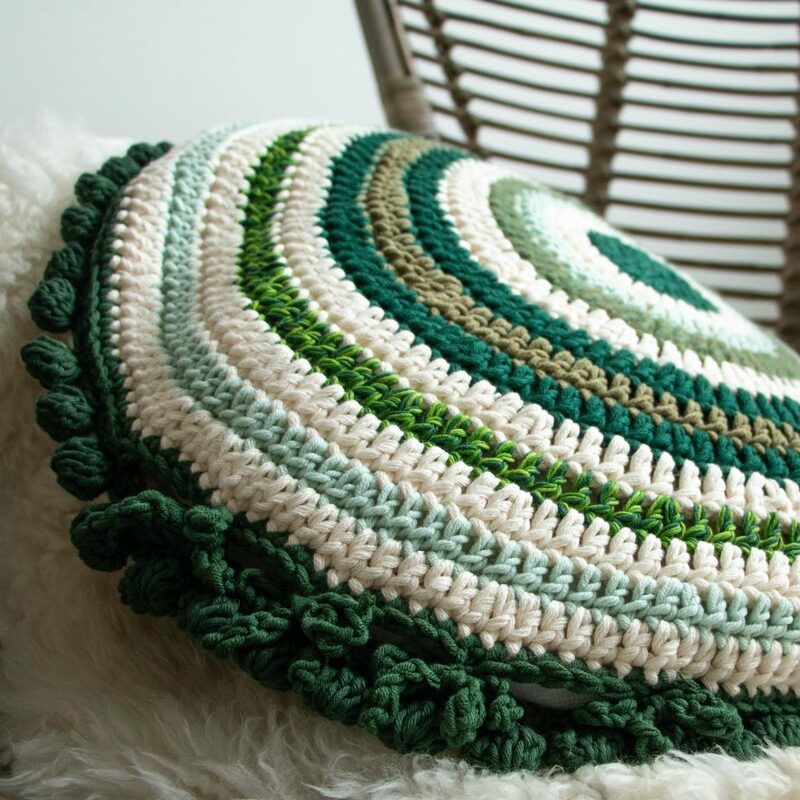 After that I crocheted the back, of course using the same colors that were in the front, and then I picked a dark green to crochet my pom-pom-border. 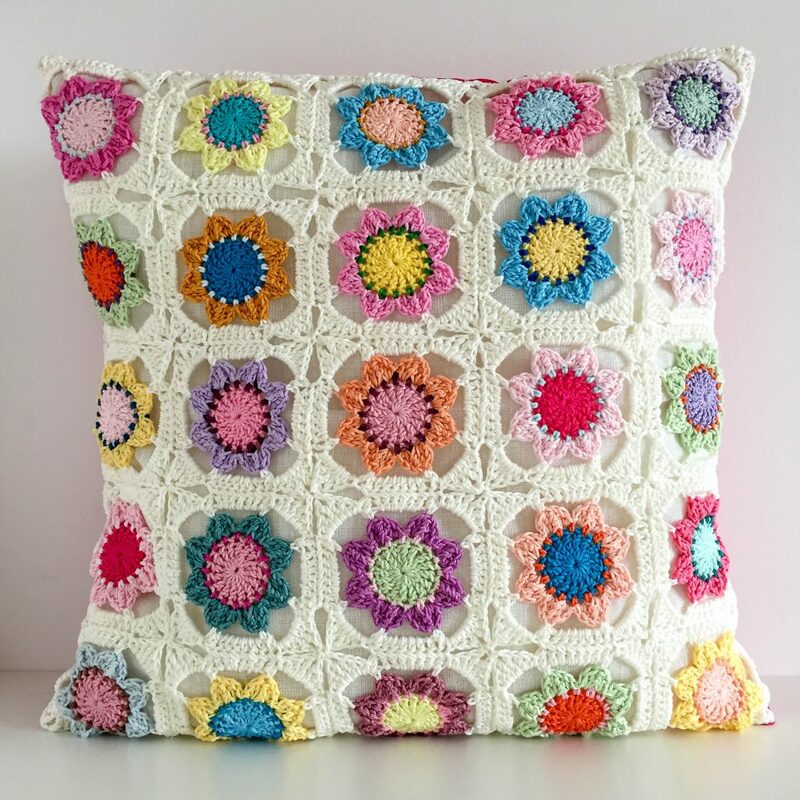 The pom-poms were hand stitched to the front of the cushion, after which I hand stitched the crochet part to the front-with-pom-poms, leaving an opening of about 25 cm, so the insert can be removed, and the cushion can be washed. 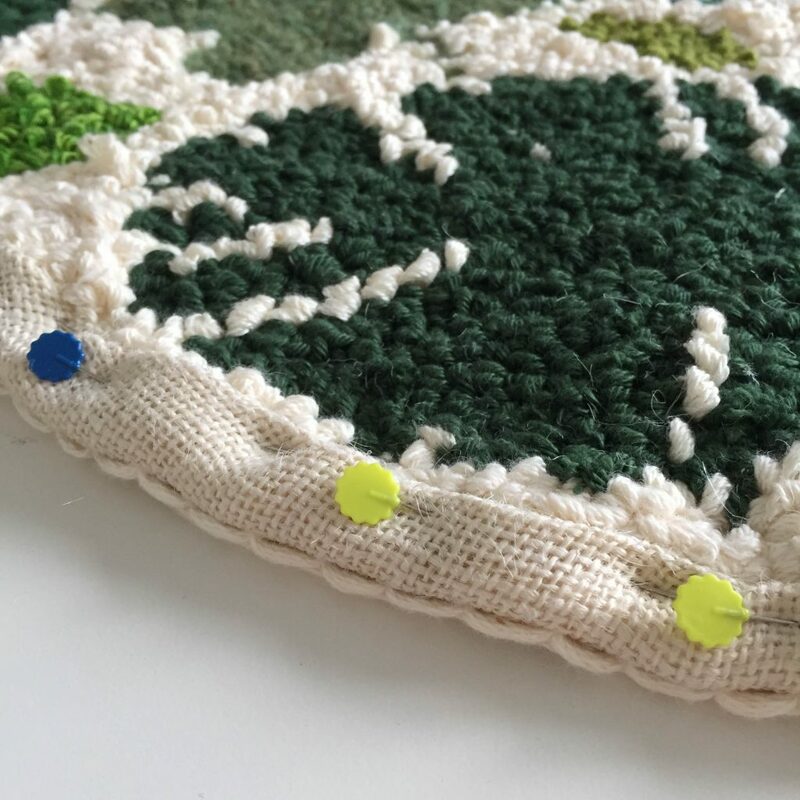 I crocheted ribbons, tied them, thus closing the opening. 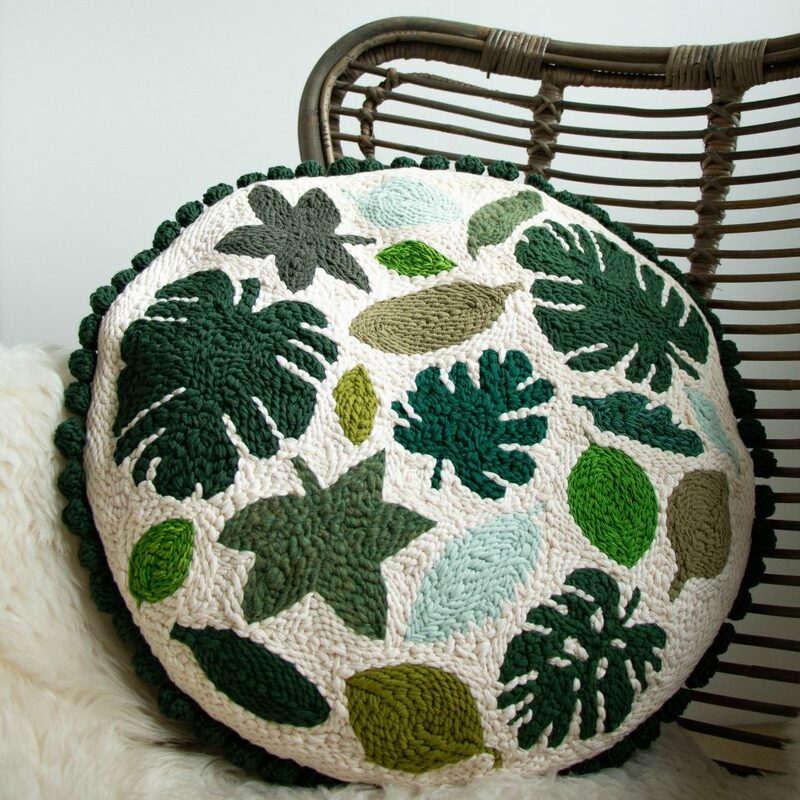 As always I had a hard time deciding what side of the punch needle part should be the front … I loved the flat stitches, but the side with the loops was beautiful too. 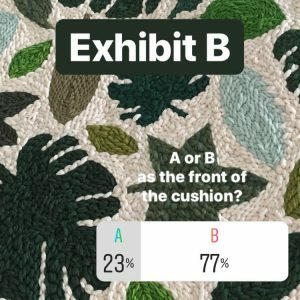 A quick poll on Instagram (fun!) made me bite the bullet and go for the non-loopy side. Now that it’s finished, I have absolutely no regrets –> it turned out just perfect. What would you do? 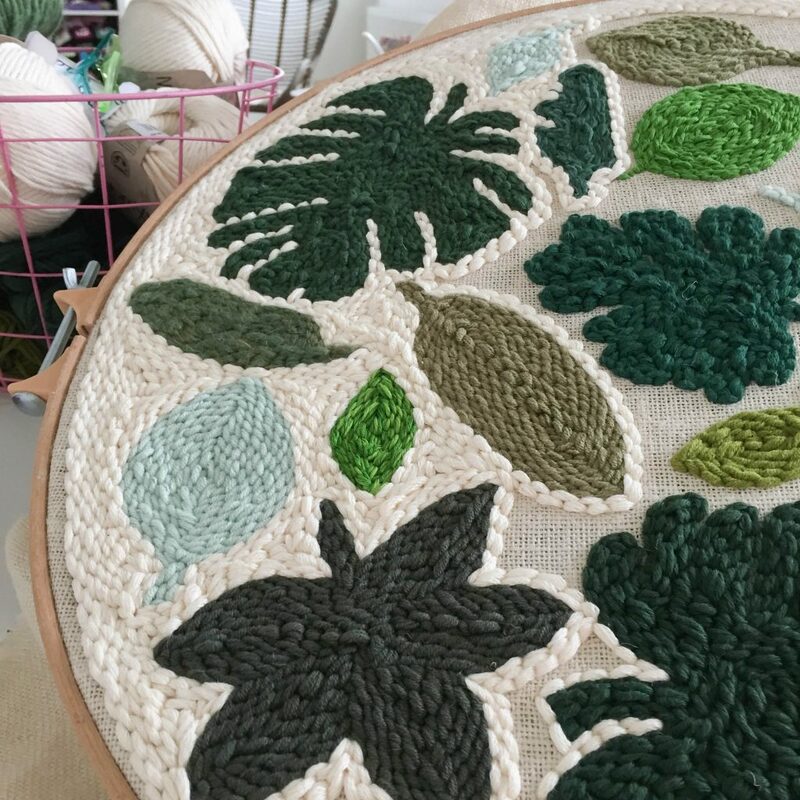 Just go for it (bye-bye wip-list), or stick to the program? 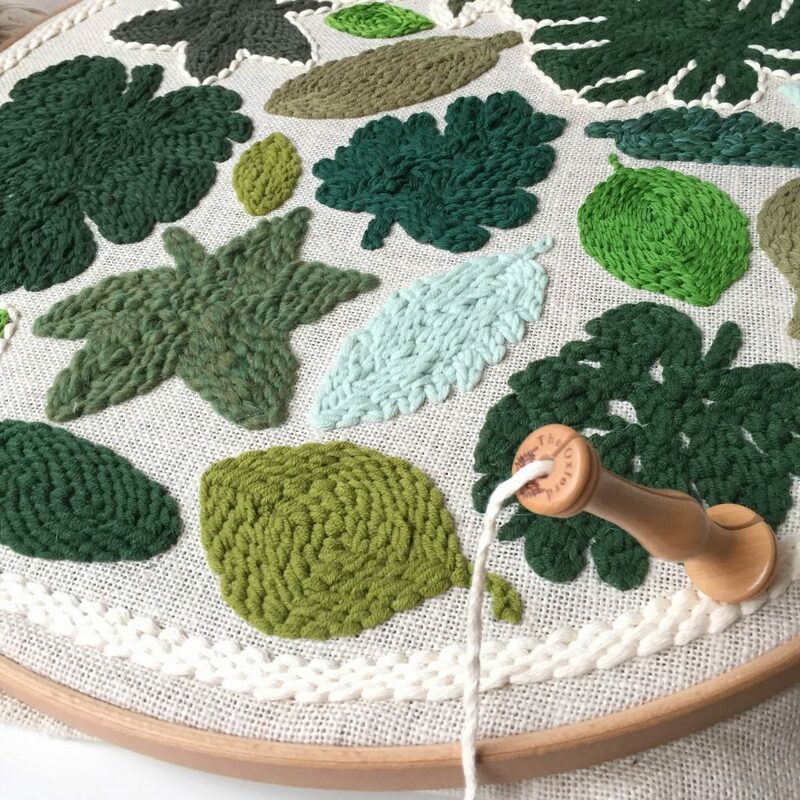 Are you a one-project crafter, or a multi-project person like me? Whatever you are: I’m wishing you many hours of happy making! 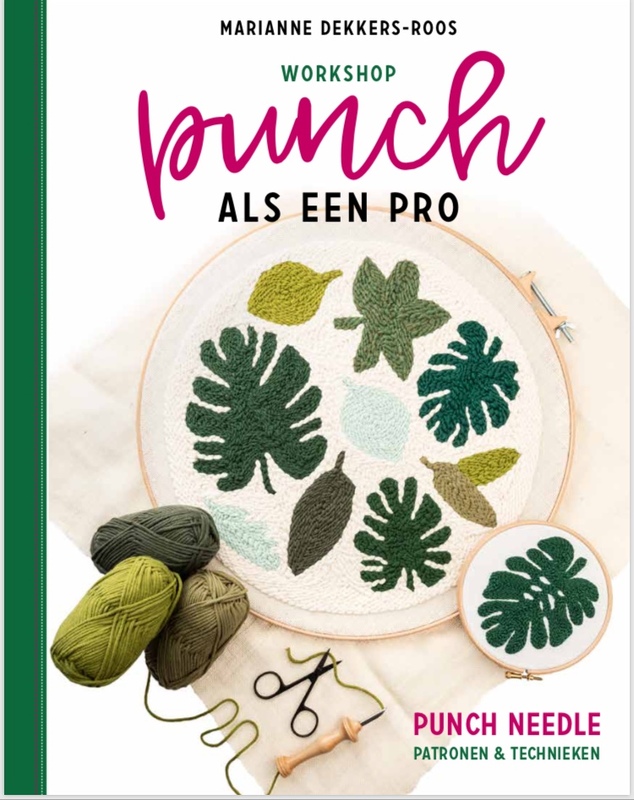 Hallo Marianne, wat een prachtig kussen! Maar de sjaal is mijn favoriet! 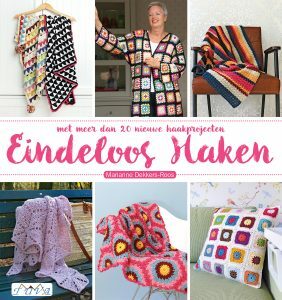 Ik hoop dat daar spoedig een patroon van komt.